Who is Eligible to Submit a Research Proposal? What Type of Research is KySGGA Interested In? All research projects that KySGGA/KySGPC fund benefit Kentucky small grain producers by producing results that will increase on farm profitability. 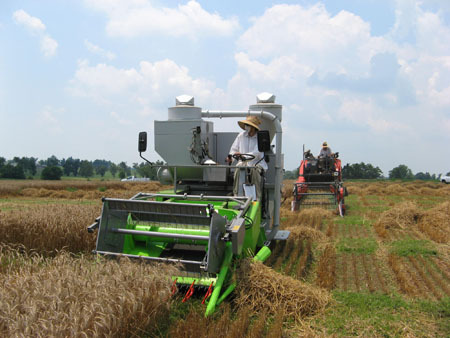 Projects should be geared to research of small grain crops (wheat, barley, oats, rice, rye, triticale) or of production/marketing issues and methods that may benefit all Kentucky crop growers. NOTE: If you are new to our process and would like to submit a one page pre-proposal synopsis of the research for feedback prior to the deadline, please feel free, we will be glad to discuss the viability of the ideas. What Should be Included in the Research Proposal? Interested researchers should fill out the Research Project Proposal Form, Budget and submit a project summary that provides reasons why the research is needed, methods that will be used, and the conclusions expected of from the research. The Kentucky Small Grain Growers Association will not provide grants for any overhead expenses incurred while conducting the research project. The primary investigator is responsible to see that KySGGA grant money is used to pay for the specific items listed in the Proposal Budget of the Research Grant Application. In addition to providing a written research proposal, researchers will be required to present an 10- to 15-minute oral proposal at a KySGGA/KySGPC Board Meeting, held August 9, in Elizabethtown. Researchers will be contacted by KySGGA in order to set a presentation time and to provide details about the meeting. How Do Researchers Obtain a Research Proposal Form? Proposals for the 2018-2019 growing season are due August 1, 2018. Where Should Proposals Be Sent? Emailing proposals are acceptable and preferred. Please send to laura@kysmallgrains.org. Where Do I Go to Give My Funding Request Presentation? The KySGGA/KySGPC will invite you to attend their Joint Business Meeting on August 9, 2018. You will be contacted regarding a presentation time and will have 15-20 minutes to present your funding request. We will have a LCD projector and laptop available for your use, but is not required. What Happens If A Research Project is Selected for Funding? Researchers will be notified if their project has been selected for funding by the KySGPC. The KySGPC office will draw up a Memorandum of Agreement and send to the researcher's institution administrators. Once the MOA has been signed by both parties, researchers agree to follow deadline dates for submission of reports and other parameters agreed up by both parties. Extension may be granted for final reports with a written request 30 days prior to the deadline. If terms are not met, KySGPC may request for funds to be returned. Any researcher completing a project is required to give a brief presentation at the August 9th meeting. We are also asking for a written progress report/news article for all completed and continuing research projects. These may be published on our web site and/or grower newsletter. Deadline for these articles is September 7, 2018 in an electronic format (Word, PDF). Photos and or graphics are also welcome high resolution - at least 200 dpi at actual printed size - is preferred. Ky Small Grain Growers voted to fund the following research and grower education projects, for a total investment of $298,235, in the 2017-2018 growing season. Research reports from this past year's projects will be available soon.